About visionaries one of the characters in Spectre the latest 007 film, directed by Sam Mendes of American Beauty fame, says “the psychiatric wards are full of them.” And therein lies the seamless drive of the film. As you’re watching Spectre with its villainous cartel, you might find yourself asking what is this all this about, what is C (Andrew Scott), the new British intelligence honcho up to in trying to make a world wide network of information? What’s in it for him? Not necessarily economics. No he’s a visionary, the most dangerous embodiment of evil. You might perhaps think of the NSA collecting information or even a luddite like Snowden, who has undoubtedly caused his own share of mayhem in his campaign to create ultimate transparency. On the other side of the dialectic is the whole question of obsolescence. Bond (Daniel Craig) is not only threatened by evil digital wizards, but so is the whole idea of the glamorous self-motivated agent. One of C’s aims is to rid MI-6 of the 00 program. Who needs these individuals or even the human mind when you have machines? Along with the anachronism of the James Bond type agent, Mendes is quite artful in introducing quaint and now outmoded objects as part of his design. Instead of a DVD, Bond comes upon an old fashioned video tape in one key scene. There’s a l948 Rolls Royce and a vintage train replete with a luxurious dining car of the kind that was found on the old Orient Express and berths. Towards the end of the film Spectre’s leader Blofeld (Christoph Waltz) asks Bond why he’s come. “I came here to kill you,” Bond bluntly responds. “I thought that you came here to die,” Blofeld replies. “I’d call it a matter of perception,” Bond counters. And that's ultimately what the film is about, not gold, not power in the classic sense, but a perception of how life should or should not be. Sound familiar? Perhaps this will ring a bell in a world where the greatest danger comes from people who are willing to blow themselves up for a cause. 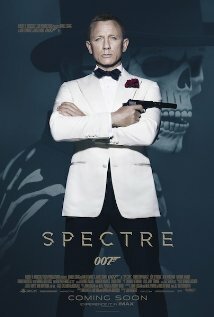 Spectre follows all the conventions of the usual bond films with exotic locals (Mexico City, Tangiers, London, Rome’s Janiculum hill, the Austrian alps) and women (Monica Bellucci and Lea Seydoux). But its gratifications and thrills extend beyond mere entertainment to the extent that it traffics in some rather chilling and timely ideas; millenarian ideology is the grail here. Don’t miss this one.